This is neither intended to be, nor to become a "review". It's just a collection of information and notes. 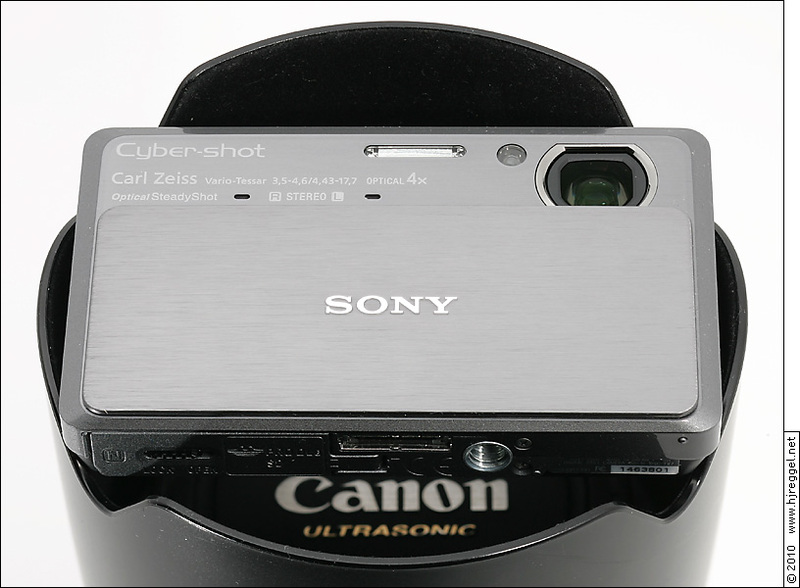 The SONY DSC-TX7 is my third T-Series camera. 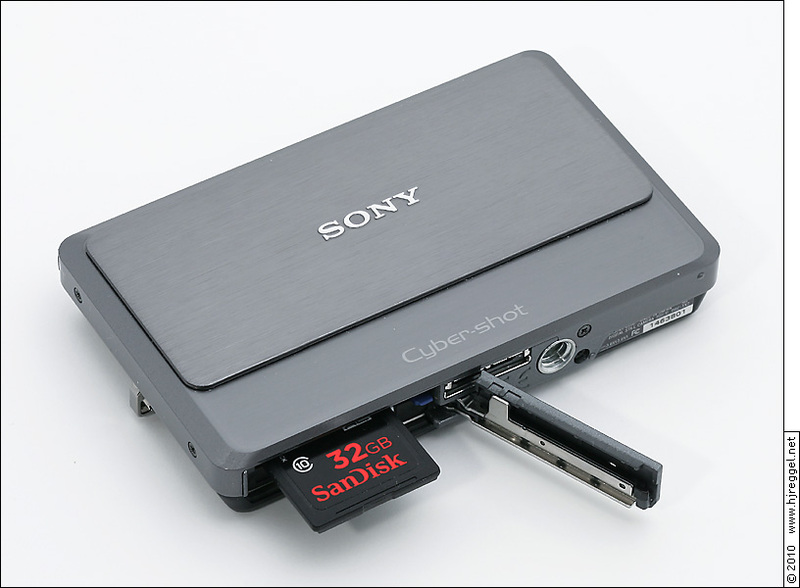 I started with a SONY DSC-T3 in January 2005, because my other camera got too big, and I wanted the most compact 5MP 3x zoom camera available: "The ideal measurements for a camera are 90-60-19." 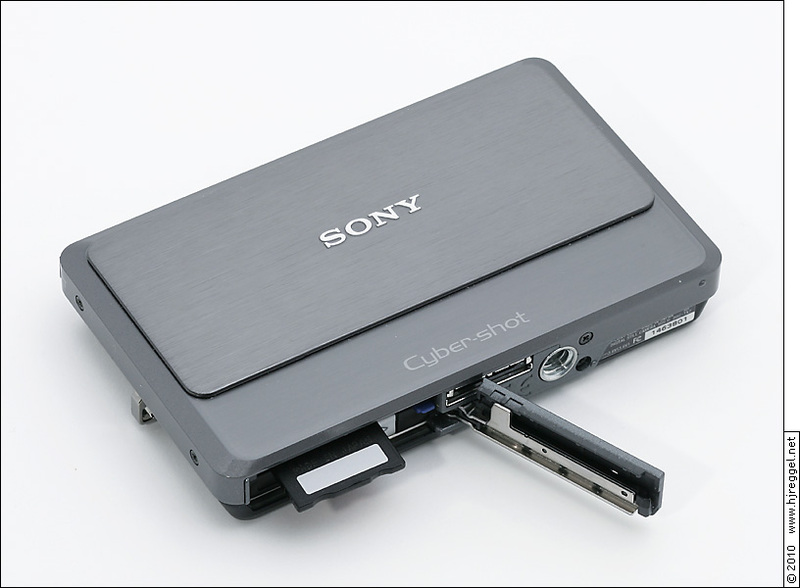 When SONY added the optical stabilizer to the T-Series, I was very tempted to get a new model, but I did not like the shape of the available models. 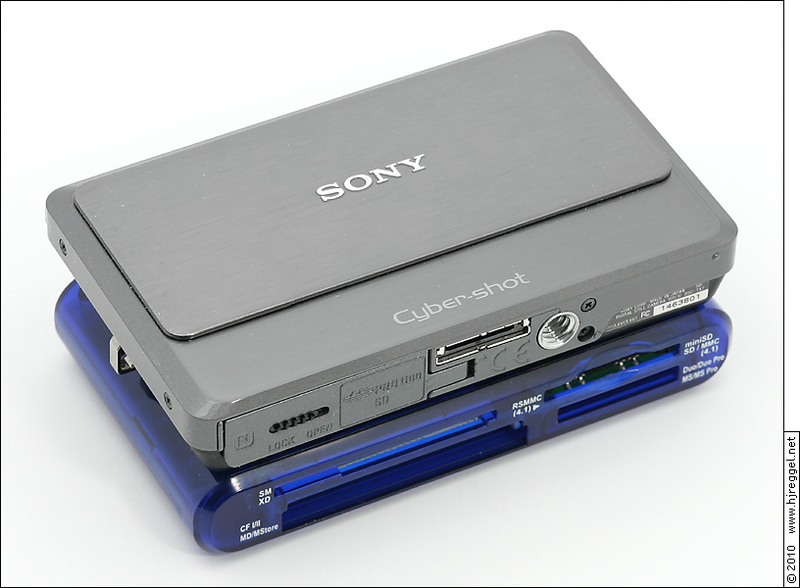 I finally switched to the SONY DSC-T700 in October 2008, because of the perfectly flat and compact body design. Because of the 25mm wide angle, I decided to get the SONY DSC-TX7. Besides the different focal length range, the DSC-TX7 has a lot of improvements compared to the DSC-T700. From the beginning, I had the impression that outdoor shots are not as crisp and clear as they should be. In special, I did not manage to get a sharp iSweep panorama. After comparing my TX7 with a demonstrator model at the shop, I decided to have the camera sent in. After two weeks I could pick up the camera, where the repair note only said "Softwareupdate". The camera was well packed, perfectly cleaned, and the front slider seems to work smoother than before. However, the image quality is the same as before. This is a side-by-side comparison of 100% crops from two still image shots of similar focal length. Comparison: Far distance subject, DSC-TX7 vs. DSC-T700. This is a side-by-side comparison of 100% crops from two different DSC-TX7 (mine and the demonstrator from the shop). I still hope that this is due to a defect, and that it will either get fixed next time I send in the camera, or the replacement model will work at least as good as the demonstrator from the shop - because I really like the 25mm wide angle, and the improved feature set. While doing more comparisons between the T700 and the TX7, I noticed that the TX7 seems to have different exposure strategies. 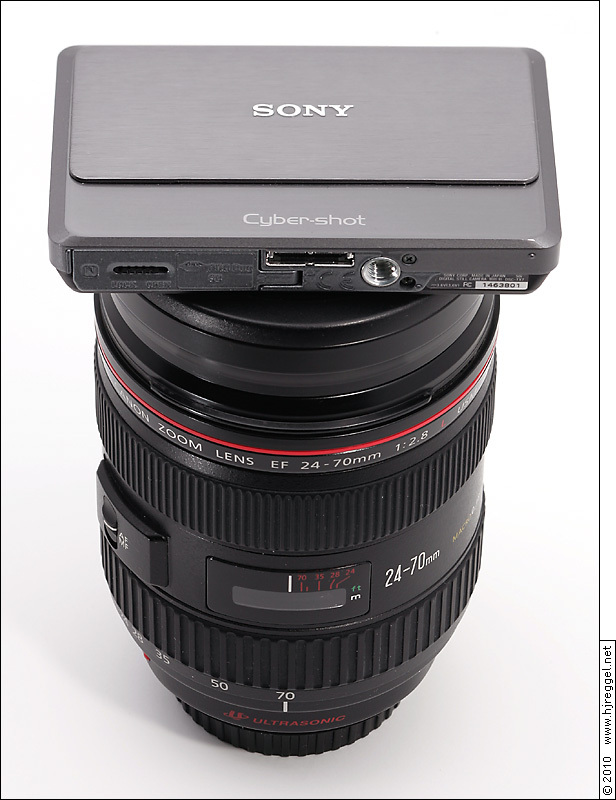 When shooting in Close Focus mode with forced flash under normal light, the T700 stops down to f/5.6. The TX7 did the shots at f/3.5, with shallow depth of field and very soft corners. Even after using a strong flashlight, the camera only stopped down to f/4.5. With forced flash, exposure should not depend on the ambient light, at least not that much. I will do more tests as soon as I get the camera back. If my observations are correct, then the close focus mode of the TX7 is next to useless. Having an aspect ratio of 4:3, the camera captures a little less width, and some more height than a 3:2 Full Frame DSLR camera. Using a 24-105mm lens would cover about the same wide angle height and telephoto width, but for cropped formats, there is no single lens covering the whole range. When I got my camera back from the service, the note only said "Softwareupdate", so I decided to investigate. It looks like SONY realeases only very few firmware updates for their cameras. The firmware version is not displayed during normal operation, it has to be activated with a certain procedure. The only available update for a T series camera was for an older model using buttons instead of a touchscreen, so these instructions did not help much. But with only four buttons and the zoom lever available, there are ony very few options left for powering on the camera while pressing another button. After the claimed update, the version still reads "01". 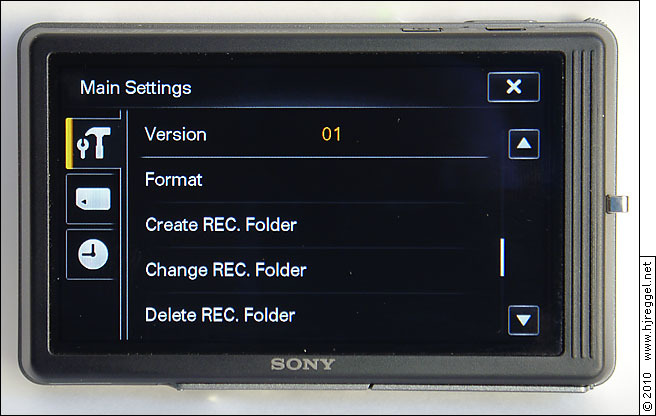 The same procedure works with the SONY DSC-T700, where the Version is displayed as "1" on page 3/7 of the Main Settings menu. Very good geometric correction in still image mode. Very good auto white balance. Support for Touch and Drag. Improved menu icons and fonts. Menu items can be customized for each shooting mode. Spring loaded battery/card door, easy to handle. Memory Stick don't insert smoothly into the combo slot. Full-time AF (pre-focus) can't be turned off. Image Stabilizer can't be turned off (active with half-pressed shutter). No fixed focus settings (indoor/landscape).